​First off, let me say that only God knows how much time anyone has left on this earth. However, doctors have a bad habit of putting an expiration date on patient's life. Oncologists are the worst for doing this. Unfortunately patients sometimes believe that pronouncement and then give up trying to live. YOU have OPTIONS...NEVER accept anyone's expiration date stamp on your life, or on that of your family member of friend. If the doctor says you only have one or two weeks left to live, I would say it’s worth giving MMS a try. Why not? Medical science has not worked and there is nothing left to lose. I have received emails from many people stating that they have revived from near death, when according to doctors they had only a week or two left. ​Cancer patient's, AIDS patients, all types of conditions...and they all got MMS and lived. See Testimonial below. The Starting Procedure - Always begin here. Begin the Starting Procedure, but in this case, remove all the stops. Ultra fast-track the Starting Procedure—do it in one day, go through each step. Take a 1/4-drop dose for two hours. Increase to a 1/2-drop dose for the next two hours. Increase to a 3/4-drop dose for the next two hours. Lastly, increase to a 1-drop dose for another two hours. This is eight hours in total of taking MMS1, increasing the intake from 1/4 drop to 1 drop over that period of time. At any time during this process if you experience an additional feeling of sickness, cut back the dose by 1/2 the amount of your last dose. For example if a 1/2-drop dose makes you feel sick, cut back again to 1/4 of a drop. Begin increasing the drops again when you feel your body is able to tolerate more. If this should be the case, it may take longer than one day to get through the Starting Procedure. Be attentive to how the body is reacting and adjust the dose accordingly. After you have fast-tracked the Starting Procedure, the idea is to move on to Protocol 1000 and proceed to Protocol 1000 Plus and to Protocol 2000 as quickly as you can, but without allowing yourself to feel worse than your illness is already making you feel. After completing the fast-track Starting Procedure outlined above, go on to Protocol 1000. Start out with a 1-drop dose the first hour and increase the drops with each dose, according to what your body can tolerate, until you reach 3 drops per dose. 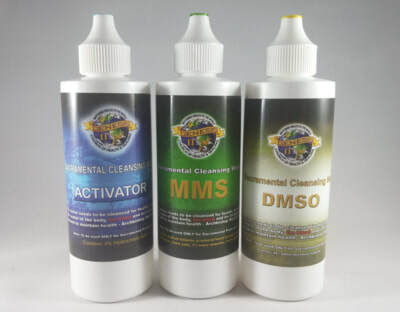 When you reach a 3-drop dose, if everything is going well and you are not experiencing any additional sickness, after three to four 3-drop doses of MMS1, you can begin to add DMSO to your doses (as per Protocol 1000 Plus instructions). After taking 2 to 3 doses of MMS1 with DMSO added, proceed on to Protocol 2000 as quickly as your body can handle it. This means keep increasing the amount of MMS1 drops and DMSO with each hourly dose according to what your body can tolerate. (The ratio of DMSO to MMS1 is 3 drops of DMSO to every 1 drop of MMS1.) If you do not have DMSO do not let that stop you, just continue to increase the MMS1 drops every hour. After two days of increasing MMS1 and DMSO drops, again, if all is going well, add in MMS2 as per instructions in Protocol 2000. At any time during this process if you experience additional sickness, cut back the dose by 1/2 the amount of your last dose. Begin increasing the drops again when you feel your body is able to tolerate more. You want to find the right amount of drops that you can tolerate without feeling worse than you already feel. 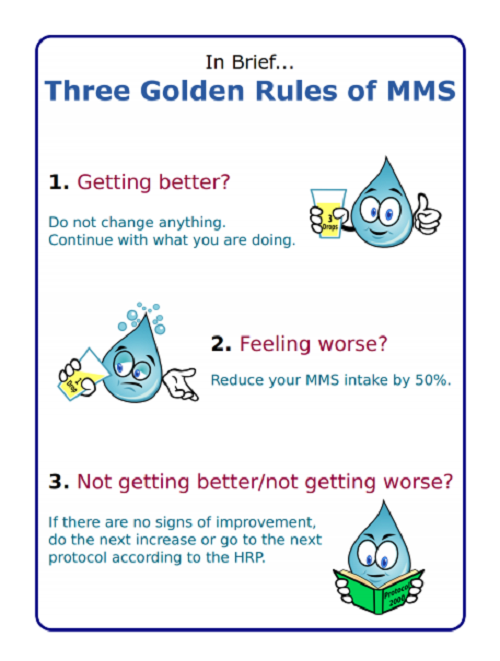 Remember the Golden Rules of MMS (see pages 83-84), especially the one that says that any time you see improvement do not change anything; continue with what you are doing. Although this protocol is suggesting to fast-track, nevertheless, if you are getting better, stick with what you are doing. As long as you are improving, stay at that dosage of MMS1, DSMO and MMS2, whatever point you are at—whatever dosage brings improvement, keep doing it. When you reach a point where you do not see any improvement for a one or two day period, increase your intake, moving to the next level. Do not take vitamins or supplements during this time. Wait until the disease pathogens are eradicated, then you can work on building up your nutrition. You can add Protocol 3000 as soon as possible while taking the oral doses mentioned above, unless you are already improving, in which case it is not necessary to go to Protocol 3000. But when you do not see any improvement for a one to two day period, add Protocol 3000 to what you are already doing. Add on any of the Supporting Protocols one at a time, especially if they are in line with helping your particular illness. For example, if the problem is colon cancer, add on enemas. If the problem is ovarian cancer, add on douches. If the problem is skin cancer, use the spray bottle and so on. Continue with Supporting Protocols if they seem to be helping, but back off any time they do not seem to be helping. Do not give MMS to someone who is unconscious or cannot swallow. It is possible to administer MMS through an IV drip. I do not recommend this, or the following tube method, UNLESS a qualified person is overseeing the procedure. For an IV drip use a 250 ml bag of IV saline or glucose solution. Put 20 drops of activated MMS into the solution. Regulate the drip so that it goes into the body over a period of one hour. This can be repeated several times a day, but other applicable supporting and additional protocols should also be used. If the person has a feeding tube you can give him MMS doses right through the tube. Mix the appropriate dose of MMS1 (according to what protocol the person is on) and pour the dose into the tube. This can be done on an hourly basis. Follow the Starting Procedure as outlined above in this protocol and continue on to the other protocols as instructed. Depending on the situation, in the case of someone who is unconscious or who cannot swallow here are other ways to get MMS into the body: Protocol 3000 (external application of DMSO and MMS1). The Bag Protocol is another option if they are conscious but have a problem with swallowing. If using the bag, make absolutely sure that the person cannot get a breath of the gas as that could cause harm. Depending on the circumstances one may also be able to do an MMS bath. (A foot bath could also be helpful if the person is unable to get into a bathtub.) If you are the one who is sick, you will need someone to help you, preferably someone who is knowledgeable about MMS. But if for some reason that person is not available, hire someone you feel confident can help you and have them read this book. A few years ago a mature woman with full blown AIDS was brought to our church for prayer. My pastor asked me to help her. Since she had already declined to take the anti retroviral medication on her own accord, I put her on Protocol 1000. I also gave her my soft-bounce mini trampoline. Since she could not walk on her own, I gave instructions for her relatives to assist her on the trampoline until she could bounce on her own. She also had several healing scriptures which she had to read 8 times daily, just as with the use of MMS and the trampoline. Two weeks later a woman fitting the description of a gym instructor strode into our prayer meeting. It took some convincing to confirm that this was the same shadow of a woman with full blown AIDS! We were dumbfounded: It's TRUE! MMS is the real deal! I knew MMS works—but not this fast—and so thorough. That very day she had jumped on the trampoline for 1 1/2 hrs! She explained that while the 1st week was exceptionally challenging, she persevered and felt enormously better at the beginning of the 2nd week...and she was only at 2 drops per hour! MMS is a stand-alone powerhouse, and makes other protocols work incredibly better!